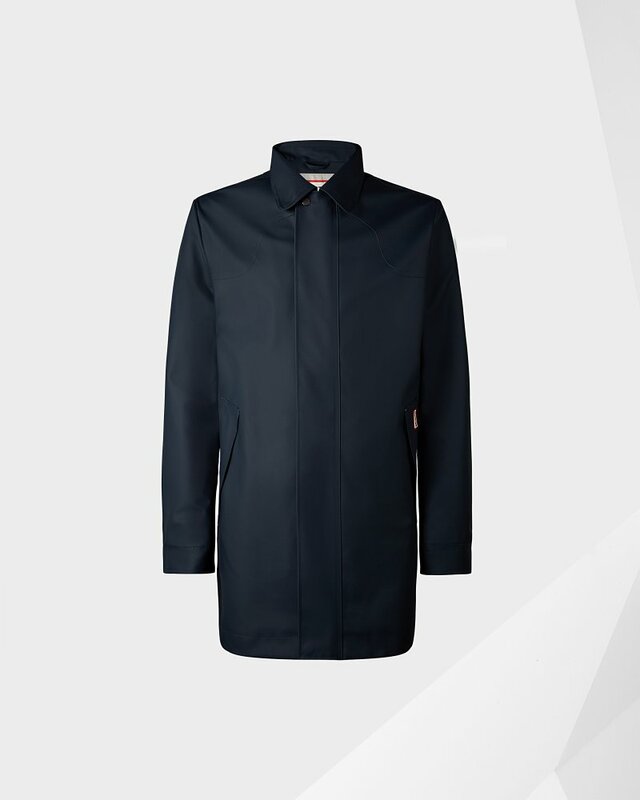 This iconic raincoat is fully waterproof with welded seams and mesh body lining for added comfort. Crafted from knitted polyester, with a rubber-touch coating, Hunter signatures include a back-storm flap with iconic Hunter moustache detail, alongside welded seams for full wind and waterproofing to keep you protected even in the stormiest of conditions. For sizing conversions please see size guide above. Rated 5 out of 5 by PeterDavidMartin from A really great raincoat Had this coat for some time now and it simply fits the bil for a raincoat. It is waterproof, smart and easy to wear. Rated 3 out of 5 by CTLondon from Love the jacket...........but! I bought this item a few weeks back and have loved it, up until today. Today I noticed, having worn it for the first time in the rain, that water leaves marks on the jacket. Also, perfect timing wise, a few minutes before seeing this review request I cut my little finger on the backside of the fastener inside of the cuff. As I said, I love the jacket but now I’m very disappointed that I will have to be careful each time I wear it.